Halloumi cheese, the Greek non-melting cheese, is deliciously tangy and salty, and absolutely scrumptious when served warm. It’s best griddled or grilled, and when marinated it makes for an extremely tasty dish. 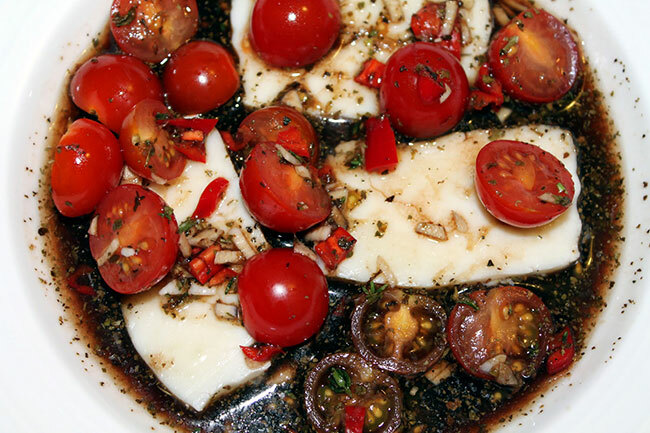 Halloumi cheese and tomatoes are a great match, and add a herby salad to the mix and you have a wonderful salad. Halloumi isn’t a very fattening cheese and as it has a powerful taste, a little goes a long way. With salad, textures are always important. The dominant texture in this salad is the warm griddled cheese, which is really really smooth and the walnuts give a crunchy dimension to the salad and lifts the whole salad. 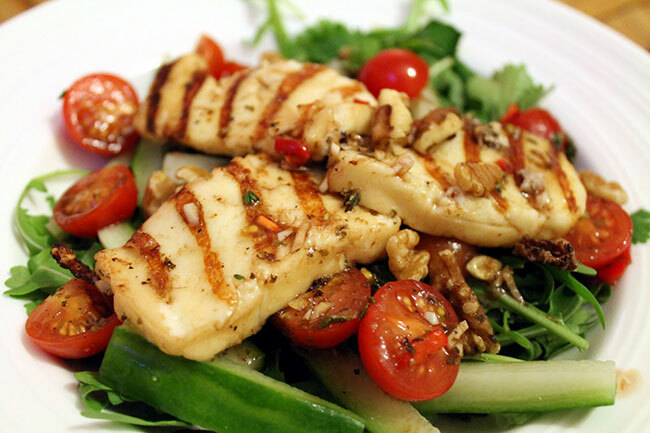 The marinade used in this salad is a wonderful Mediterranean combination of thyme leaves, dried oregano, lemon juice, black pepper, honey and balsamic vinegar and diced red chilli. Slice the Halloumi, mix the marinade ingredients together in a shallow bowl. Marinate the cheese slices with the tomato halves in the marinade for 30 minutes. 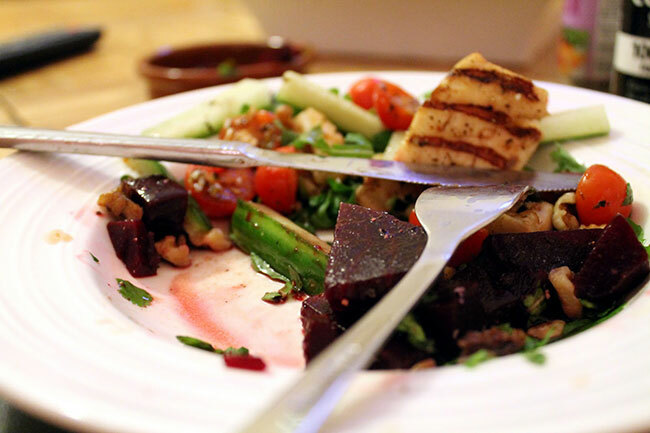 To make the beetroot relish, add the chopped beetroot, balsamic vinegar and mint. 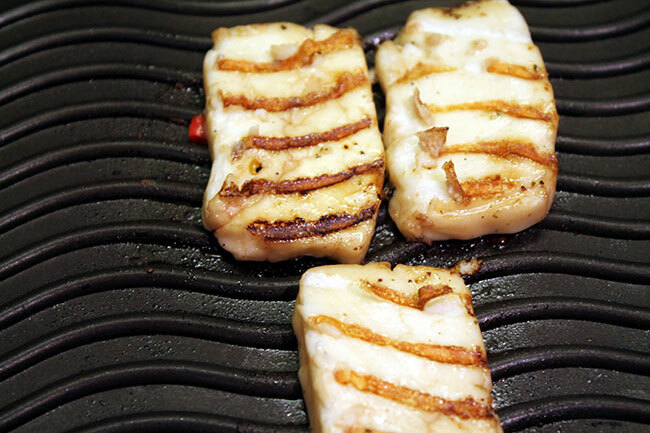 Pre-heat a griddle pan and fry the Halloumi slices 1 minute a side. Meanwhile to make the salad, slice the cucumber thinly. Combine the rocket and herbs and the tomatoes and marinade juices and toss well. 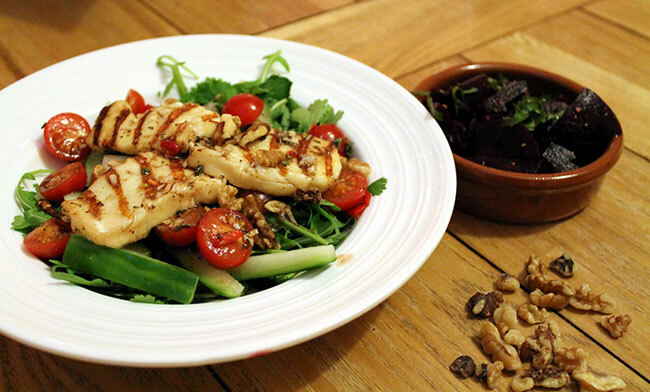 Place the grilled Halloumi on top of the dressed herby tomato salad, scatter with the walnuts. 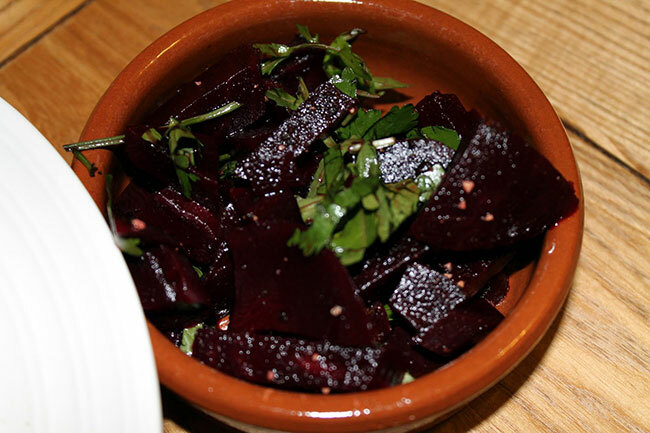 Serve with the beetroot relish.